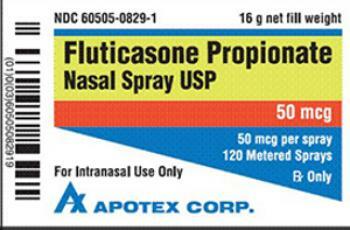 Apotex Corp. is recalling one lot of Fluticasone Propionate Nasal Spray, which has been found to contain small glass particles. The firm has not received any reports of adverse events related to recall. Customers who purchased the recalled product should stop using it immediately. Consumers with questions may contact Apotex at (800) 706-5575 from 8:30am – 5:00pm (EST), Monday thru Friday, or by email at UScustomerservice@Apotex.com.